Zac and Cindy Edwards are seen on their wedding day in Orange Beach, Alabama. Zac Edwards, a Coast Guard petty officer 2nd class and former lifeguard, rushed into the water after taking photos for the wedding to save a swimmer in distress on Thursday, Aug. 2, 2018. 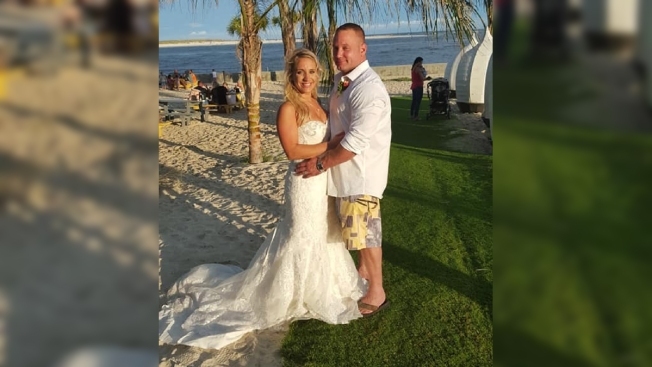 A bridegroom has been credited with saving a struggling swimmer just moments after his beach wedding on the Gulf Coast last week. Zac and Cindy Edwards had just gotten married at Orange Beach, Alabama, and were taking wedding photos when a woman came up and said someone was struggling in the surf, WALA-TV reported.